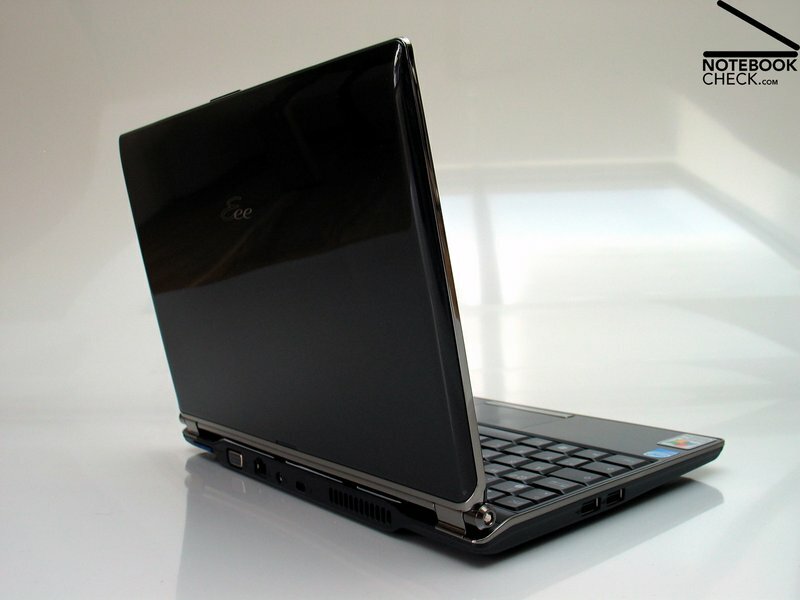 Although the classical Eee 1000H notebook rated first class in our tests and still belongs to the leading models, its design could never really convince. After Samsung launched a serious competitor with the NC10, Asus now counters: The Eee PC S101 especially addresses netbook users who appreciate a good design. 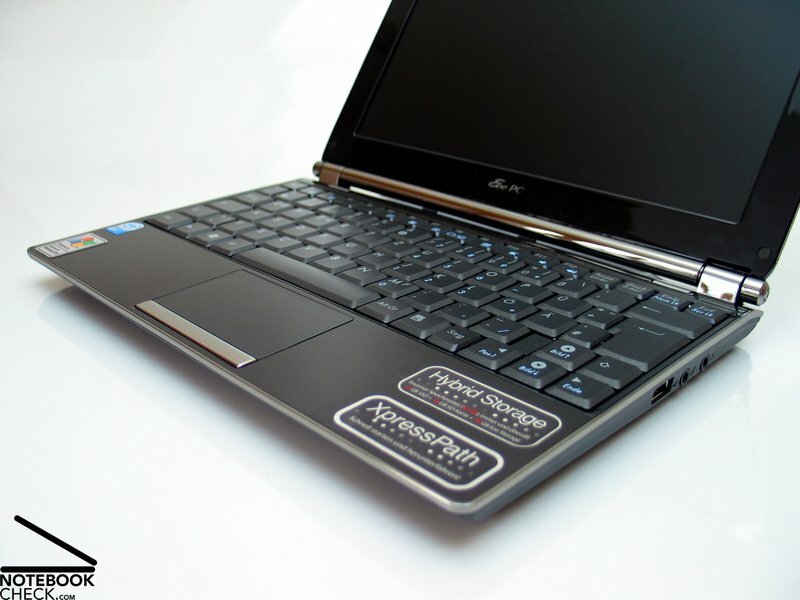 Although many other manufacturers also broke into the netbook market in the meanwhile, the Asus Eee PC can still be considered dominating the branch of mini notebooks. 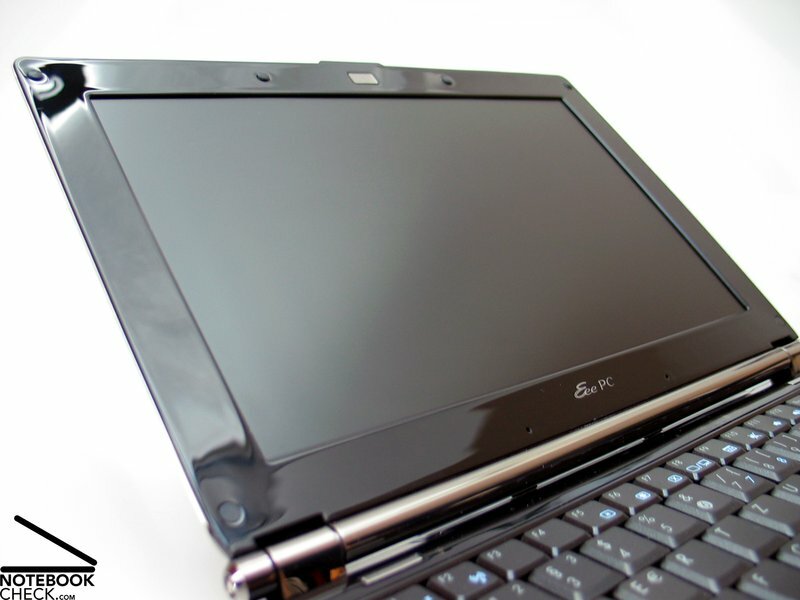 Thereby, the Eee PC 900 series with 8.9 inch screen but also the recent Eee 1000H model with bigger 10 inch screen and clearly more user-friendly input devices rank among the most important models. 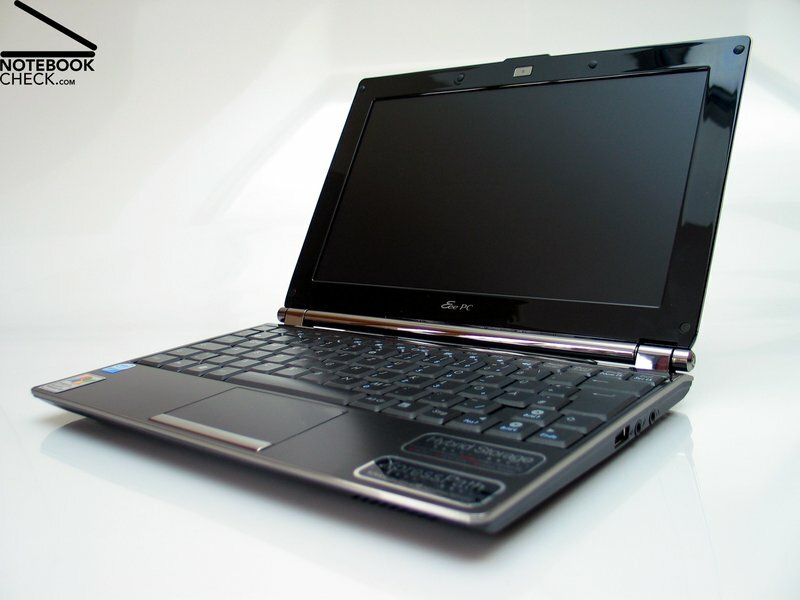 Of course also a comprehensive review of the Asus Eee PC 1000H is available here at notebookcheck.net. 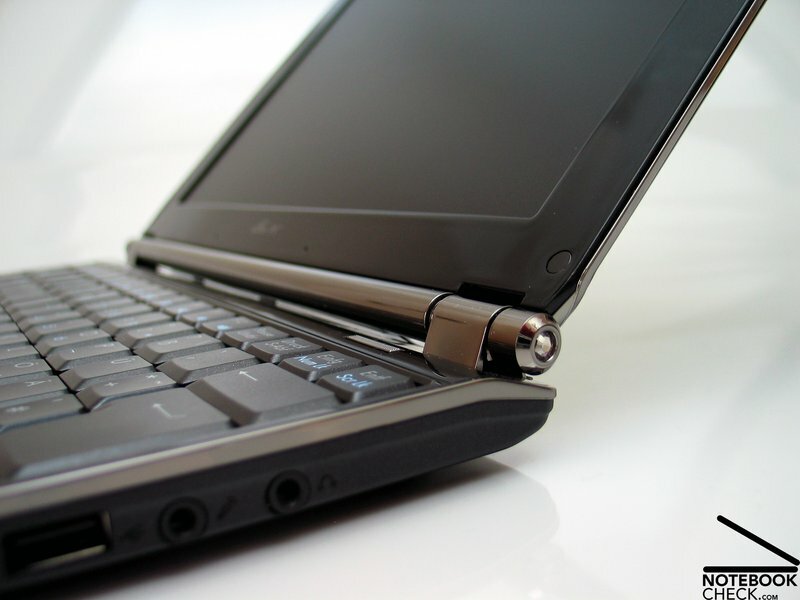 The clearly slimmer base unit probably is the most important change of the design compared to the Eee PC 1000H. Excluding the feet the base unit is just 1.4 centimetres high. Furthermore, the front part tapers to a small edge. Also the wedge shape of the Eee 1000 H was consigned to history, because the S101 now relies on a very thin battery integrated in the front part. Overall, the new shape was kept simple. Straight lines and gentle curves offer an elegant look of the notebook. 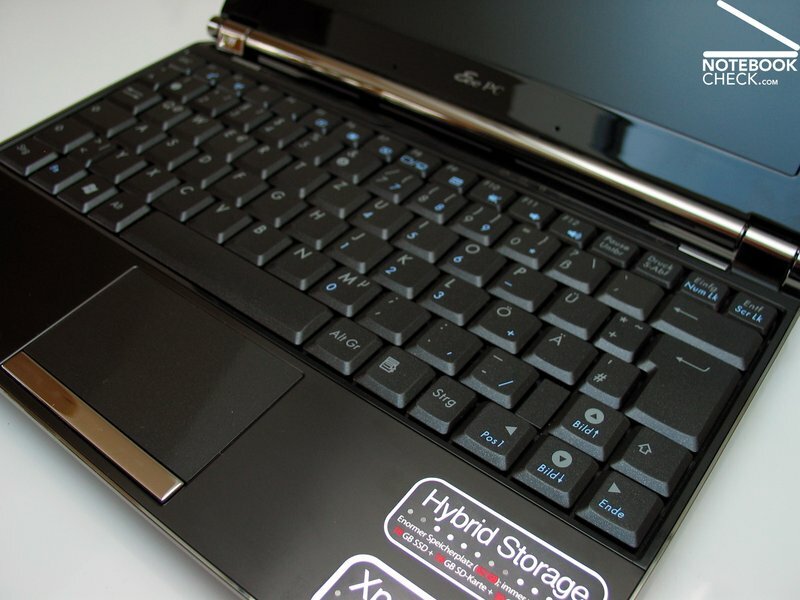 Also the used materials play an important role in the Eee PC's change of image. 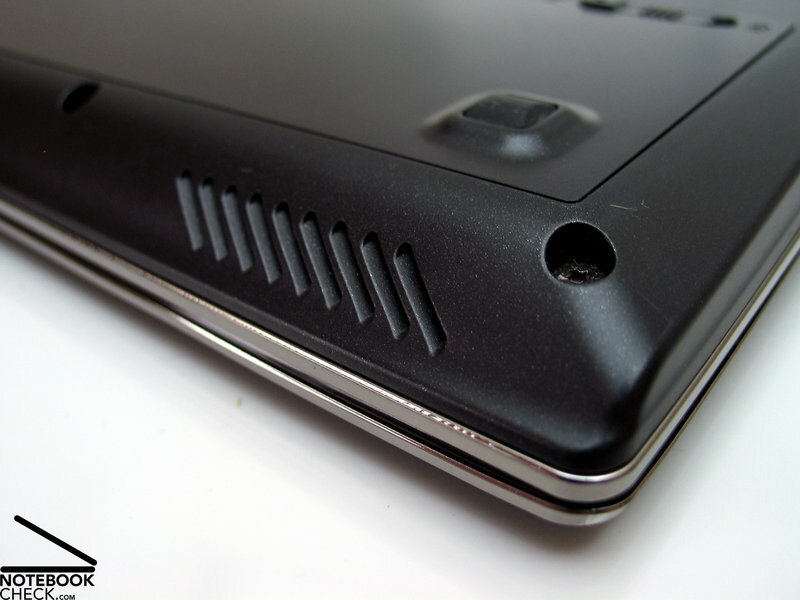 Except of the obligatorily high-gloss lid, metal elements could especially convince by their haptics. This includes a metal moulding around the screen in stainless steel look, and also palm rest areas made of decently brushed and dark finished metal. Furthermore, the look of the part around the hinges at the bottom edge of the screen was improved. Now it is also made of metal and both sides bear two precious stones from Swarowski as crowning finish. Fortunately these are carefully integrated into the hinges. So, even those who refuse jewels on notebooks surely won't mind. 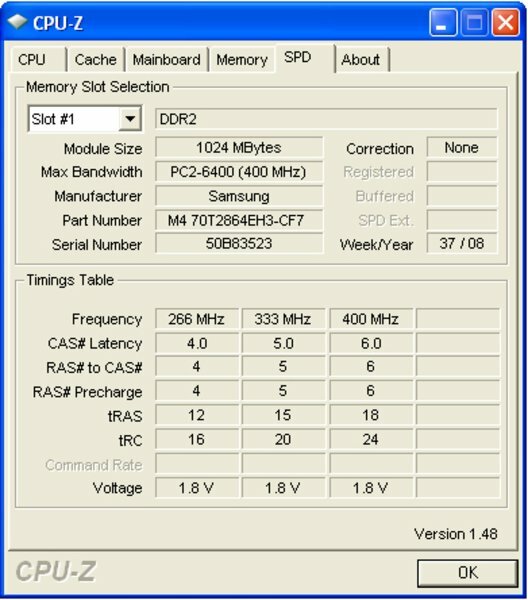 The case of the Asus Eee S101 rates also good in terms of stability. Although the height of the part was considerably reduced, also the S101 is sufficiently and well resistant against pressure and flexing. Nevertheless, we sometimes heard creaking noises during handling this notebook, which slightly reduces the impression of the quality. 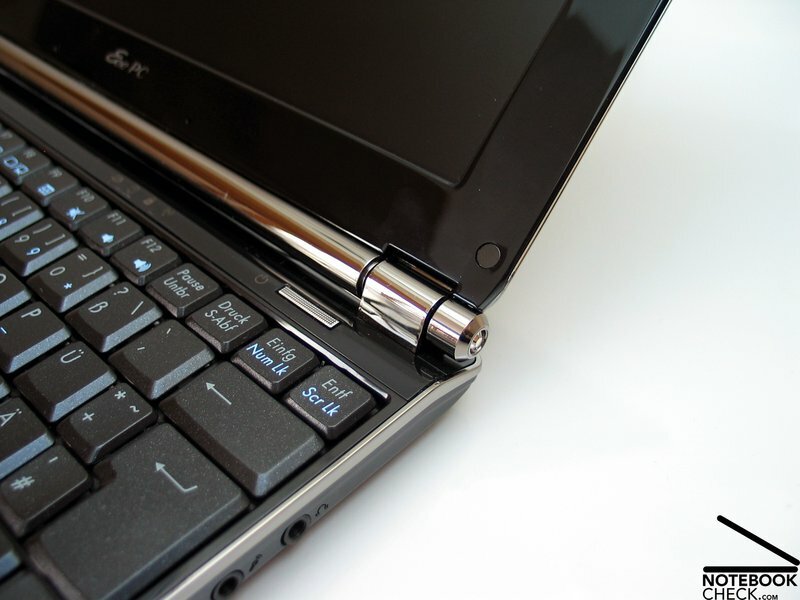 Although the two hinges are not extremely big, they usually well support the screen. Only upon lifting the notebook at the screen, the notebook unintentionally opens to maximum. By the way the maximum opening angle is about 140 degrees, which should usually be sufficient, even for mobile operation. Nothing new can be reported in regards of the offered interaces. Left and right of the case are a total of three USB 2.0 ports and a 3.5 mm jack for each headphones and microphone at the right side of the case. 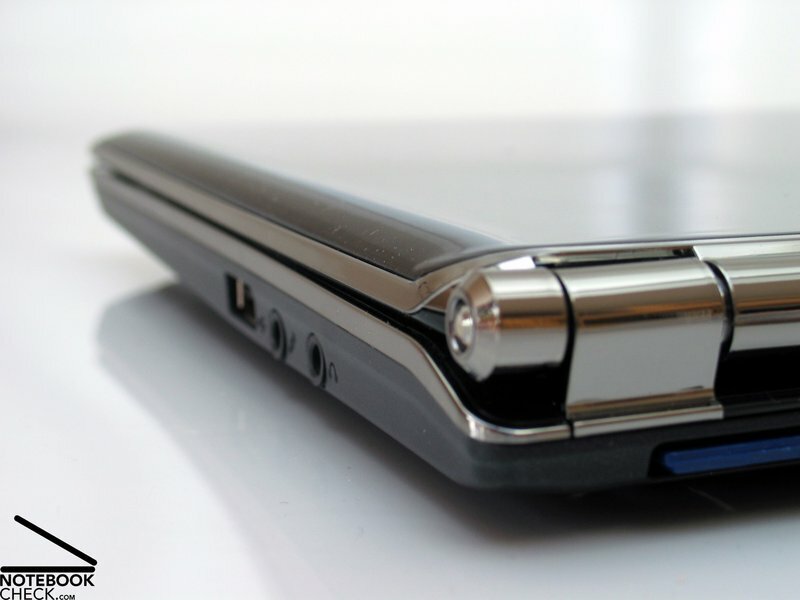 The thin front edge is free of ports. 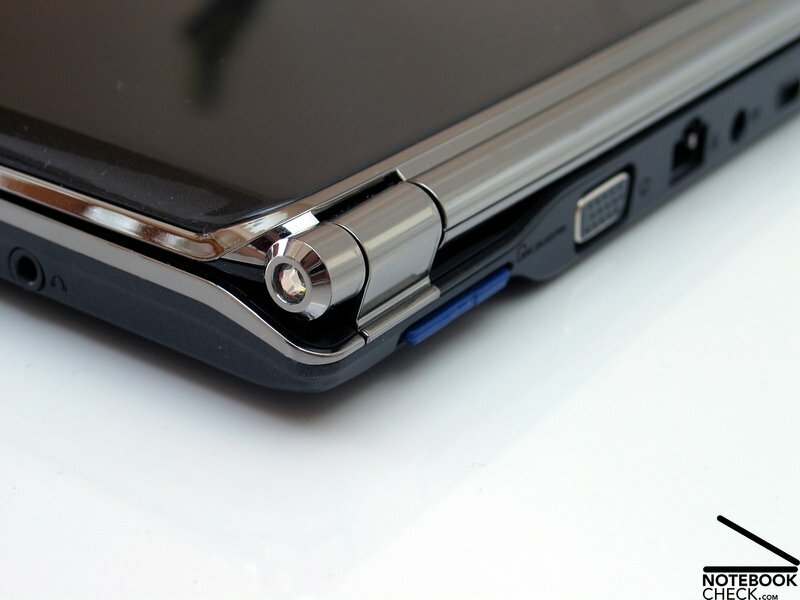 The other interfaces, e.g., LAN port, VGA out for connecting an external screen, power plug, and Kensington lock are at the back side of this laptop. The SD card reader, including a 16 GB SD card as additional mass storage ex factory, is at the back too. In general this location seems to be perfrectly alright. However, if you frequently need to substitute different memory cards, e.g., of your camera, this location of the reader can be called a little bit cumbersome. A 10/100 adapter is responsible for wired network connection. 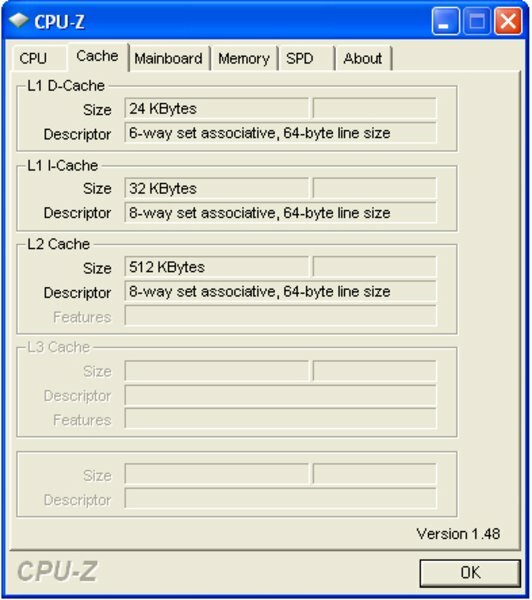 Furthermore, the Asus Eee S101 is equipped with a wireless LAN 802.11 standard-n (b/g/n) adapter from AzureWave. Bluetooth V2.0 is on board too and allows communication with your mobile phone or various wireless external input devices. But, up to now a UMTS version of the Eee S101 is not offered by Asus. Inside the very chic box, there is also a protection cover, which matches the Eee design and seems to be very robust. Furthermore, Asus includes a bag for the power adapter and the respective cable, and also a microfibre cloth for gentle cleaning of the screen and of the paint surfaces in the scope of delivery. 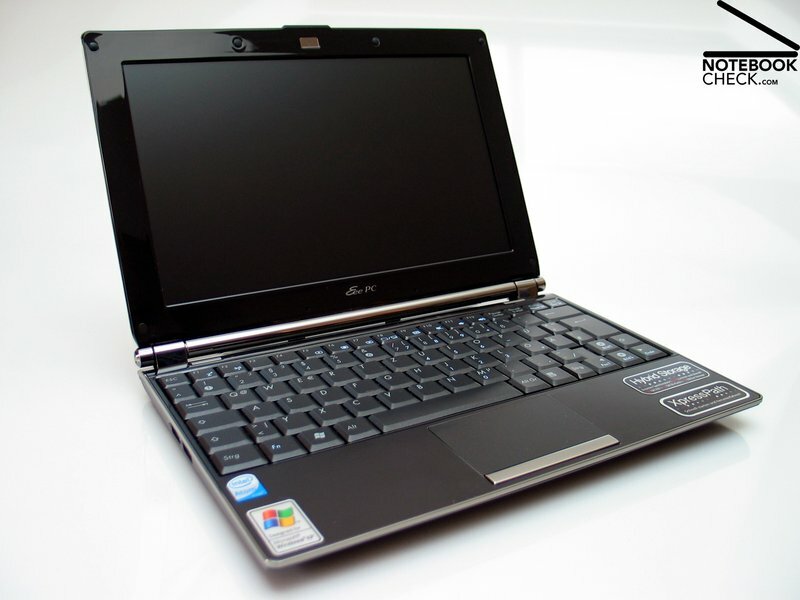 Alike for the Eee PC 1000H Asus also extends for the Eee S101 a 24 months manufacturer warranty with 'pick-up and return service'. According mass storage Asus comes up with an interesting gadget. 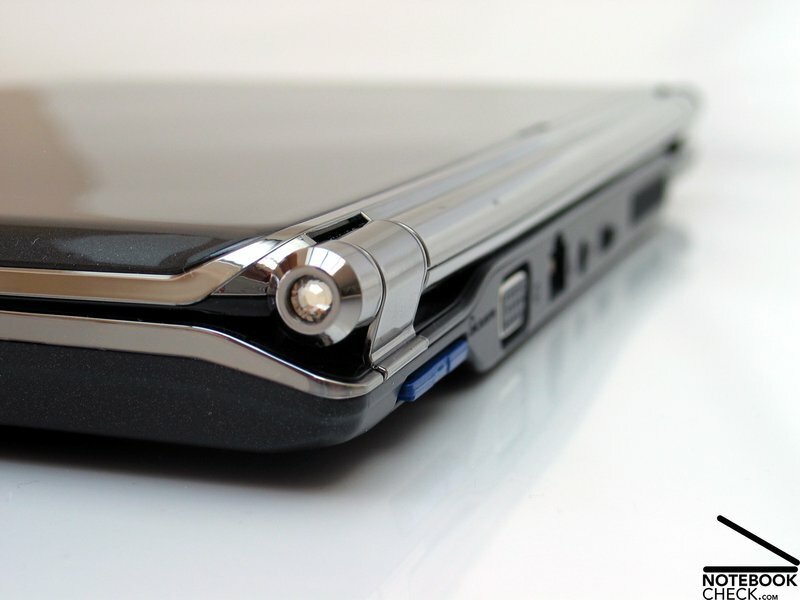 The base version of the Eee S101 is only equipped with an internal SSD with a capacity of 16 GB. In addition the SD card reader is populated with a 16 GB memory card. So, this mini notebook already has a total mass storage capacity of 32 GB. However, don't expect too much regarding performance of the provided data media. 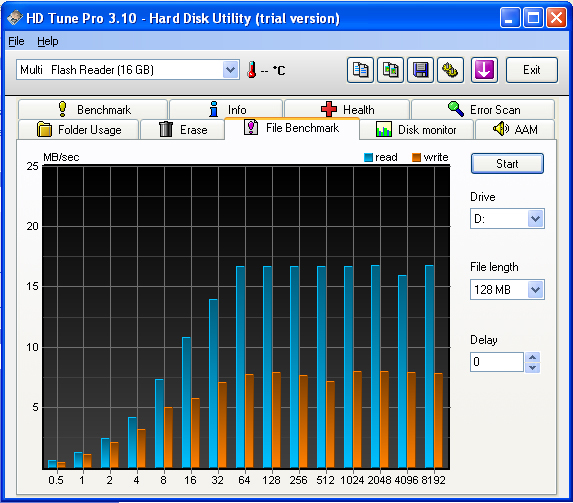 E.g., the read and write performance of the SD card reader is even clearly lower than of the built-in SSD. For further information about this please read the section about performance. Using the Eee Storage is very simple. In the file manager it is represented in a similar way than storage devices, which you can copy data to. Asus points out that the usage period of the Eee Storage is restricted to 18 months. If you register, you can extend the usage period by further 6 months. For now this service should stay free of charge, but Asus reserves the right to charge after the deadlines. 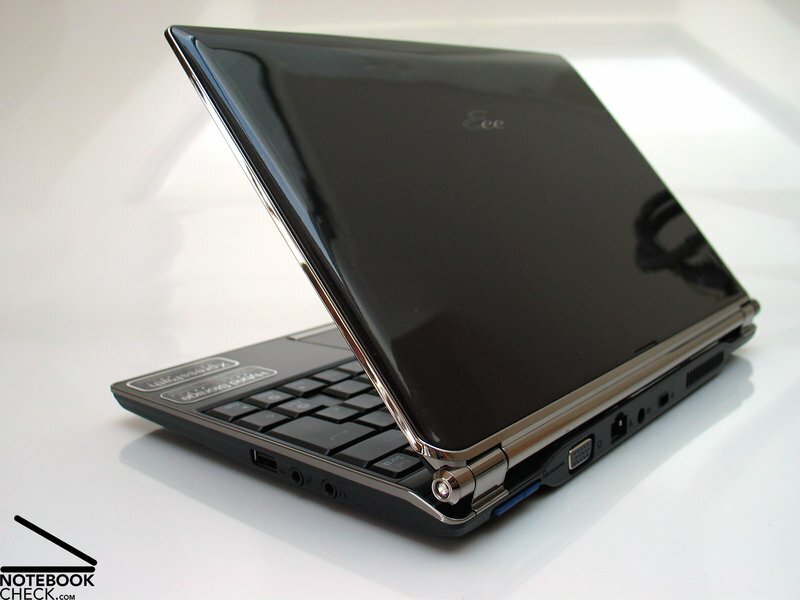 Considering key size and layout the Eee S101 apparently uses the same keyboard unit than the Eee PC 1000H, but with an essential difference. The keys are now either made of a different plastic composite or a different coating was chosen, which makes the keyboard slightly glitter. Although this harmonizes well with the look of the Eee S101 and really looks good in daylight, it harbours an inconspicious danger. During our test we also used the Eee S101 late in the night with sparely light. 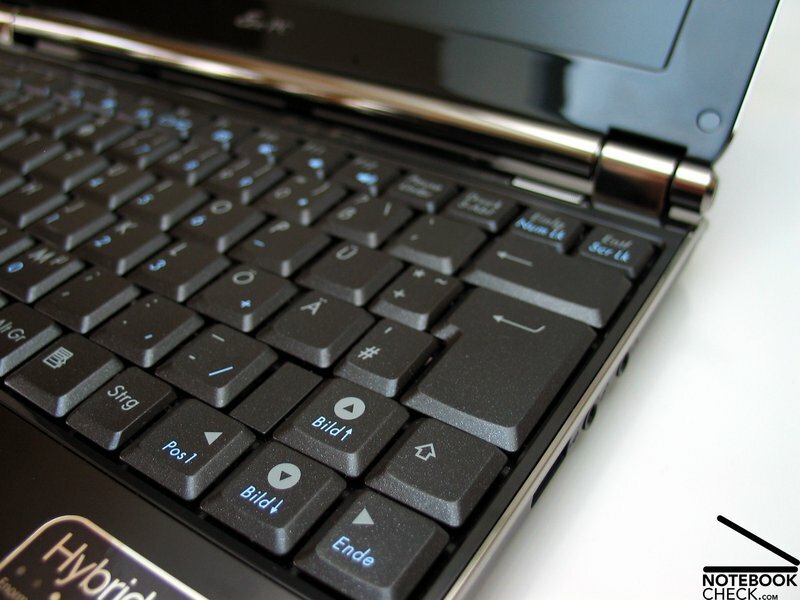 In general it is not possible to type without external light if you want to see the keyboard and not only blindly hit the keys. On the one hand the brightness of the screen is too low to also illuminate the keyboard, on the other had this netbook does, not much to our surprise, not have a separate keyboard light. Combined with an external light source, in our case a small lamp above the passenger seat in a car, the metallic particles in the keyboard lead to very unpleasant reflections, which make reading the key labels difficult. Despite being probably a rare special case, this could nevertheless be interesting for users who also work late in the evenings and in a very mobile way with the Eee. Typing with the built-in keyboard feels, alike with the one of the Eee 1000H rather good, and is characterized by a very clear feedback and carefully selected key travel. Because of the keyboard's size touch typing is absolutely possible. Even typing longer texts was no problem. 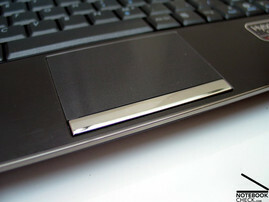 The touchpad of the Eee S101 was redesigned. It was very decently integrated into the base unit and given a comfortably rough surface. Although the touchpad buttons got a simpler look and are now made of a continuous key bar, this is not ideal in practice, because there is an annoying dead band in the middle of the bar, which blocks the buttons on imprecise hit. Once again also this model is equipped with a touchpad, which supports multi-touch feature and is already known from former Eee PC models. It recognizes multiple simultaneous touches and enhances therewith the possible ways of input. E.g., it provides a zoom feature, a magnifier, or fast scrolling by simultaneously moving two finger across the touchpad. 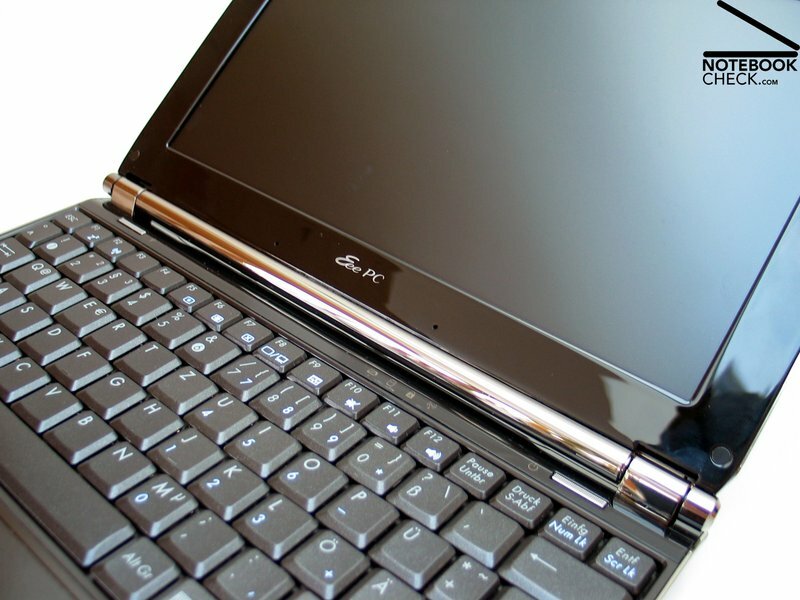 Asus equips the Eee PC S101 with a 10.2 inch panel with a resolution typical for netbooks of 1024x600 pixel. This WSVGA panel is illuminated by a LED back light. In contrary to other LED displays, which often offer a good display brightness, this one did unfortunately disappoint in this aspect. 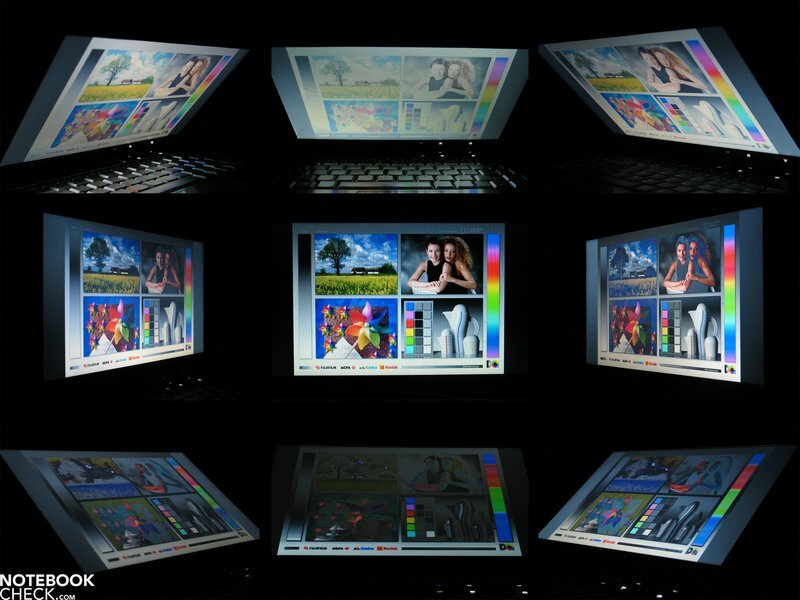 E.g., this display achieved a maximum brightness of just 123 cd/m² in the middle of the screen. The brightness even fell to 102.2 cd/m² towards the corners. Because of the low maximum brightness, this panel nevertheless has a rather good illumination of 83%. Also the black value, i.e. the minimum representable brightness, is with 0.71 cd/m² not really top. This gives a maximum possible contrast of 173:1 for this screen – not outstanding, but sufficient. 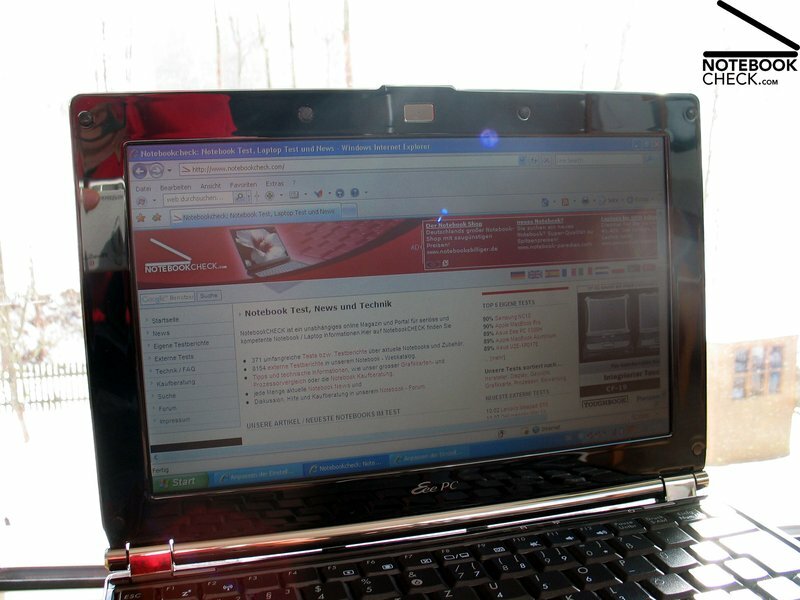 Often outdoor capability, which first of all the screen is responsible for, is an important criterion for netbooks. Having a matte display surface the built-in screen already meets the first crucial factor. However, it gets a little bit critical for the display brightness. 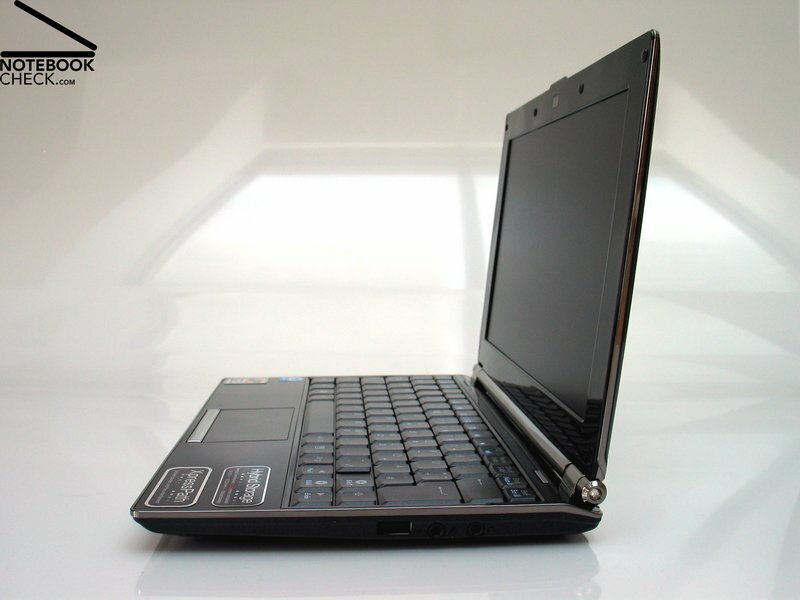 If you want to operate a notebook in the sun, the brightness should be 200 cd/m² upwards. A simple rule of thumb: The brighter the better. Transflective displays are the exception to the rule. In practice this netbook offered a legible picture, even in very bright environments. However, the low brightness gets apparent and and does not really contribute to convenience - rather the opposite is the case. Also the viewing angle stability does not belong to the advantages of this screen. In horizontal as well as in vertical direction very quickly color distortions arise. So, adapting the opening angle will be frequently required especially in mobile operation. 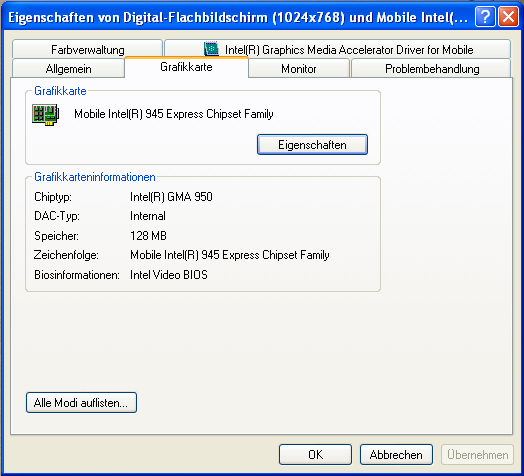 Due to hardware typical for netbooks, i.e. 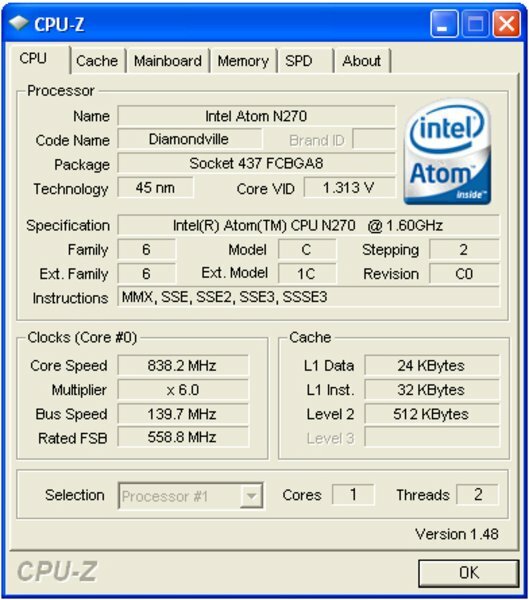 an Intel Atom N270 CPU and an integrated Intel GMA 950 graphic the results of the benchmarks are not surprising. The combination of Intel Atom CPU, integrated GMA950 graphic, one gigabyte RAM, and an built-in solid state drive (SSD) offers sufficient performance for running all important office base applications on the Eee S101. The economical Windows XP serves as operating system. 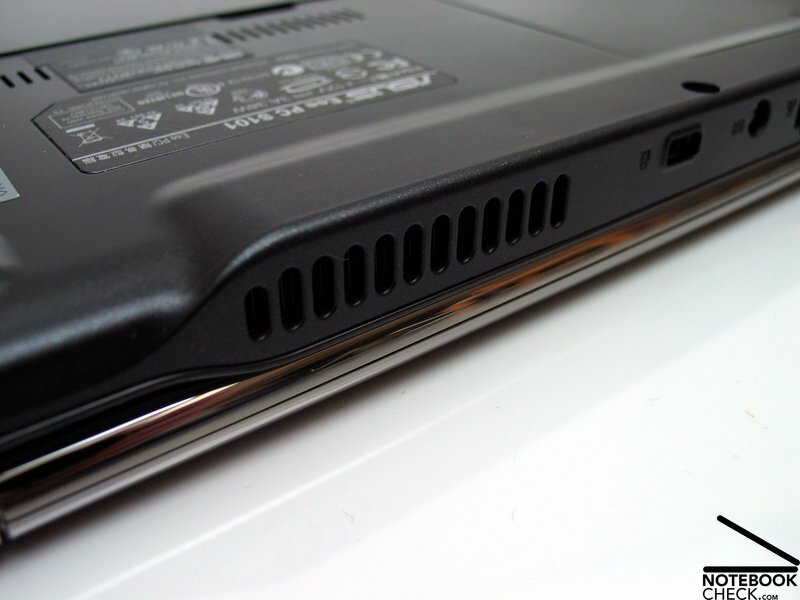 Often the question arises, whether netbooks are completely unable to run games or whether games are probably still possible. In this regards we have to mention that the integrated graphics chip is the primary limiting factor and rules current 3D games virtually out. Nevertheless, older undemanding games can be played. E.g., the well-known shooter Reaction Quake 3 ran rather smoothly on a resolution of 800x600 pixels with about 40-70 fps and could be played without problems. However, also newer games, which do not demand to much 3D performance, e.g., Fifa 08 are possible. When we tested the demo on a resolution of 800x600 pixel, we recorded rather passable 30-40 fps. Only in the interludes the frame rate fell to 15 fps. Netbooks usually do not have problems running 2D games like, e.g., SimCity 2000, which are admittedly already a little out-of-date, but nevertheless occasionally a nice amusement. Apropos amusement, also a current game with in the meanwhile big appeal, was tested on the Eee S101: World of Goo. Lovely animated 'Goo-Balls' could be joined together without problems until they were finally sucked off into the measuring glass. Regarding mass storage Asus came up with an interesting solution, which cannot unconditionally be recommended. The intrasystem mass storage device is a 16 GB solid state drive. The built-in SD card reader inclusive a 16 GB card ex factory is used to enhance the available mass storage capacity. The advantage of this solution is that you can switch cards as well as substitute the provided one with a higher capacity card in the future. This way it is possible to easily enhance the storage capacity if required. Even if this seems to be handy, the performance of the SD card reader is far below the one of the built-in SSD. The read rate of the card reader is about 17 MB/s while the write rate of 7 MB/s is even clearly lower than the first value. 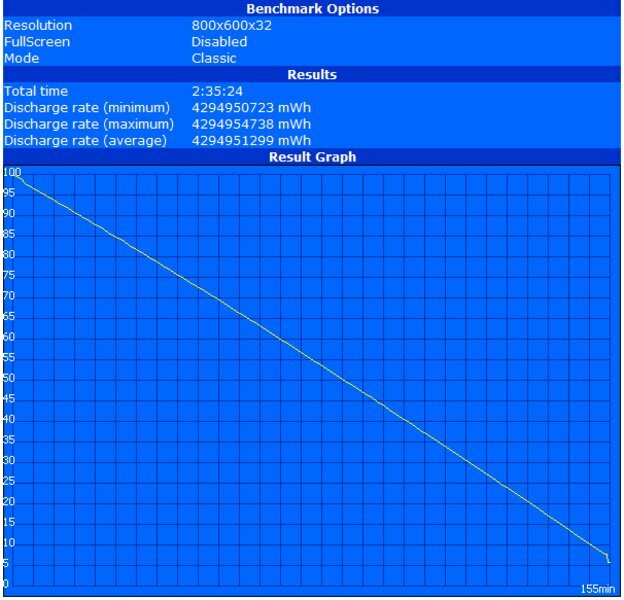 The built-in Asus JM-S41 SSD achieved clearly better results here. 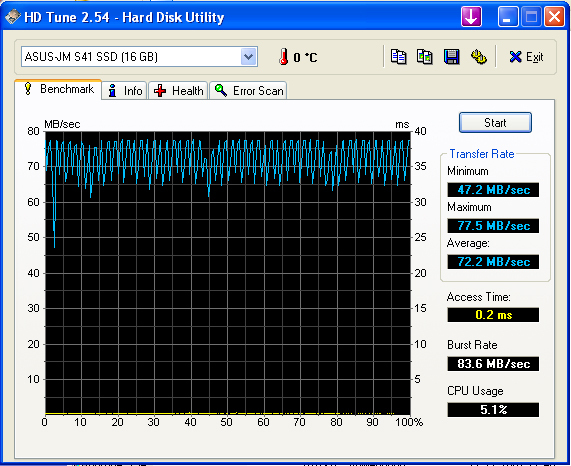 In the HDTune benchmark test it reached write rates of about 30 MB/s and read rates of up to 80 MB/s. In this aspect reasonable solid state drives still clearly differ from average standard hard drives, whose read and write rates are usually nearly the same, and can be depending on the model about 50 MB/s or even more. Only newer SSD models, e.g., the Intel X-25M recently reviewed by us, have this problem under control, and finally offer clearly better results than current hard drives in all aspects. The disadvantage here: the price. 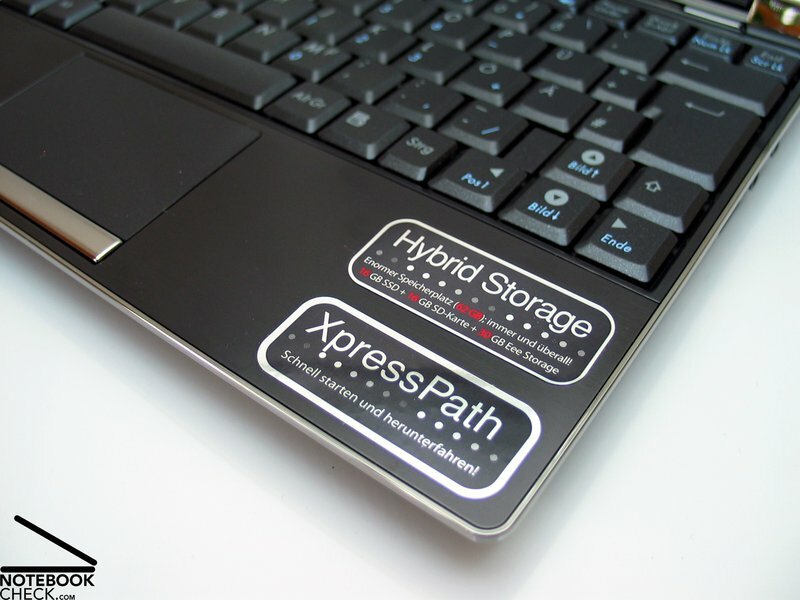 Currently such powerful storage devices cost at least 300 – 400 euros. Alike in the Asus Eee PC 1000H the system fan also always runs inside the Eee S101 and ensures a constant cooling of the case. However, this is hardly audible in idle mode (recorded noise level: 28.8 dB(A)). We were also pleased that the fan does not increase its rotation speed on simple office applications, and browsing the Internet (energy saving profile). So, this mini notebook is hardly audible most of the time. The Eee S101 does not have any problem caused by a case getting warmer. On the top side this netbook just reaches the 30 degrees Celsius level. Although it gets warmer on the bottom side, it stays with 34.7 degrees Celsius also in the green. So, this notebook is ready for mobile use, also on the lap. (+) The average temperature for the upper side under maximal load is 29.3 °C / 85 F, compared to the average of 29.8 °C / 86 F for the devices in the class Netbook. The two built-in loudspeakers could not convince at all. Located at the front edge of the case, these two speakers radiate their sound waves towards the desk. The sound of the speakers can be called very thin and nearly reverberant. Full low tones are complete missing. However, you can enjoy clear and fully sounding music via the 3.5 mm stereo jack. A new concept for the power supply allowed an important change in case design. Because a lithium-polymer battery was chosen, it could be very thin, and so there was enough space for it in the front part of the base unit on the bottom side. This extreme slimming would not have been possible with the lithium-ions technology, which is still used e.g. 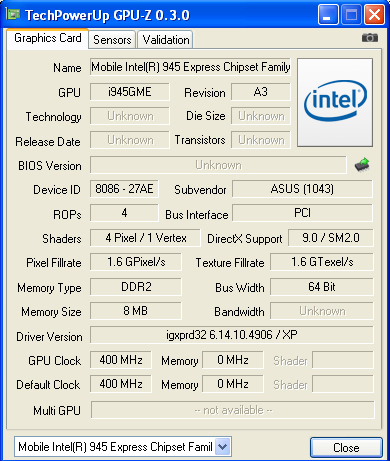 in the Asus Eee 1000H. The new battery wattage of 36.26 Wh with 7.4V and a capacity of 4900 mAh. 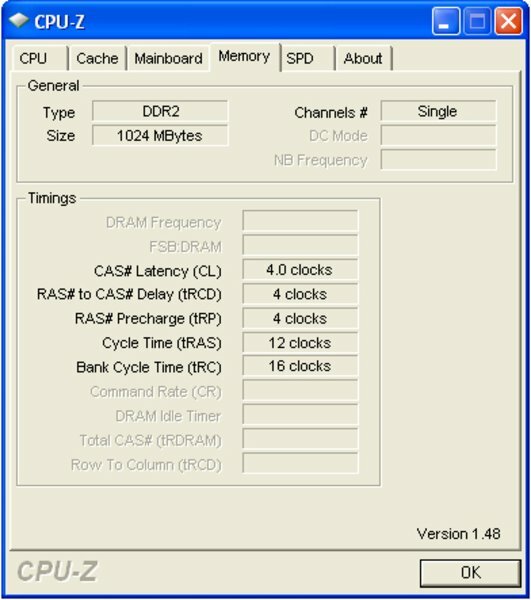 The Asus Eee S101 achieved a runtime of 297 minutes, that is nearly 5 hours, in BatteryEater Readers, representing the maximum battery life to be expected. Under load in the BatteryEater Classic test (profile top performance, max. display brightness, WLAN+BT on) the power of the battery is still sufficient for 155 minutes runtime, which is indeed a passable battery life. We were also rather satisfied with the runtime during browsing the Internet (max. 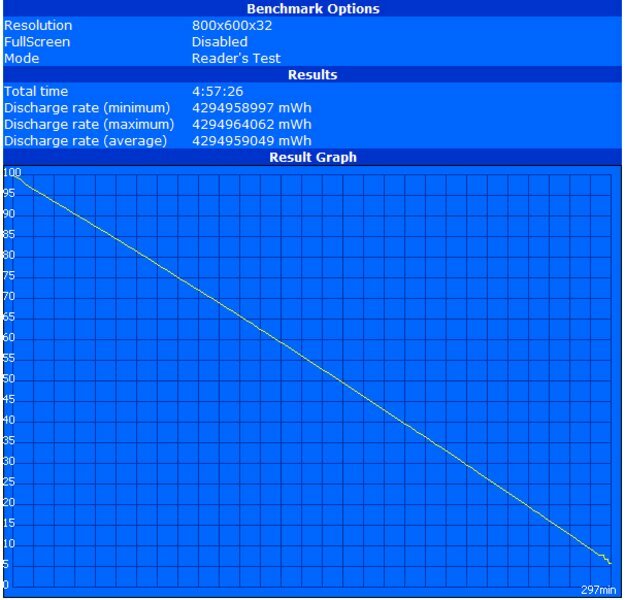 brightness, energy saving profile). 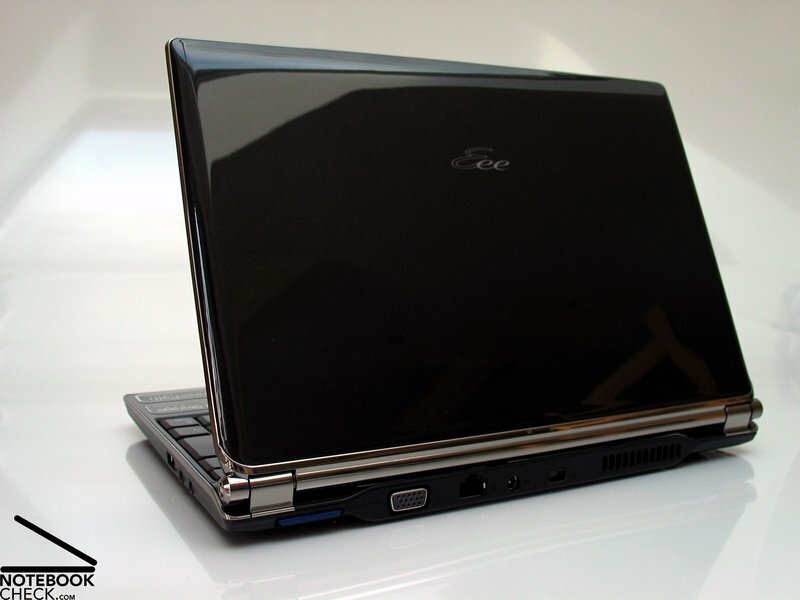 With about 275 minutes runtime the Eee S101 also has a reasonable mobility. 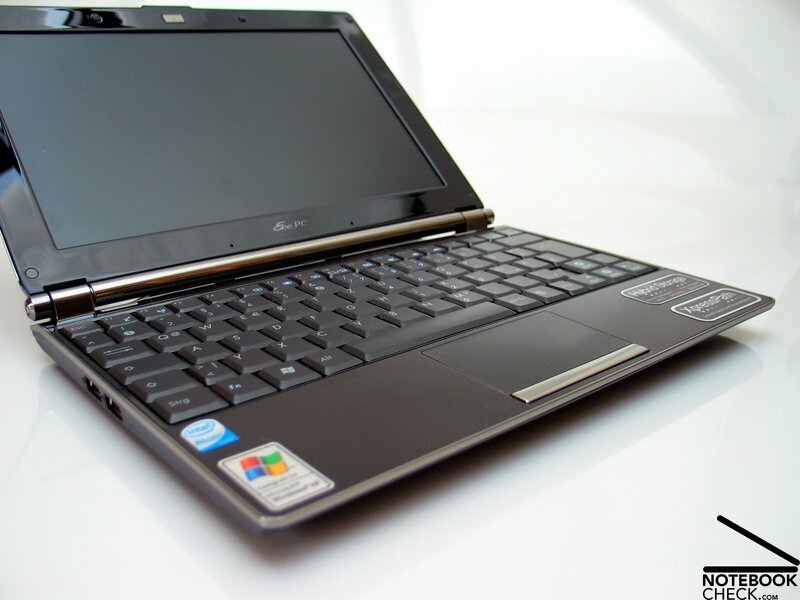 The Asus Eee PC S101 is so to say a logical enhancement of the current Eee family. It especially focuses on those who consider design important. Because of its attracting look, it might probably fly out the shelves in superstores, where customers can no longer resist its charm. Indeed, the Eee S101 comes compared to the Eee 1000H really with an improved case. The thinner, but still stabler base unit as well as the successful use of high-quality materials are favourable. The connectivity and the keyboard stayed the same. The only difference, which might maybe cause troubles, is the look of the keys, which now shows metallic particles. The built-in screen of the S101 really disappointed us. While Asus strictly focused on making the case better than the one of the Eee 1000H, it seems that it apparently took the first panel it could get hold of for this mini notebook. Except of a low illumination it could especially not convince in bright environments, e.g., in outdoor operation. 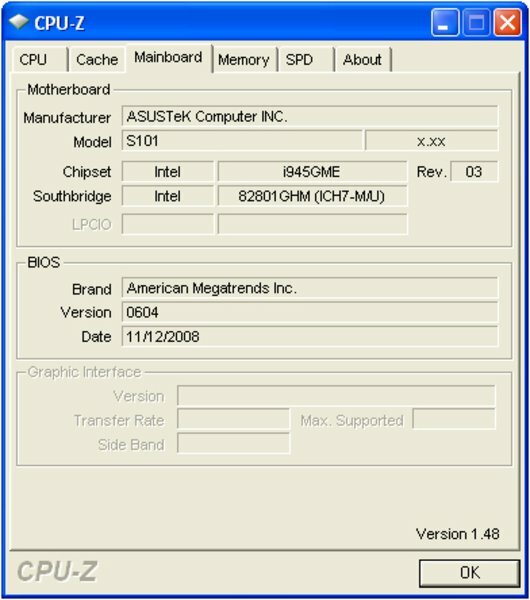 With the Atom CPU from Intel Asus did not try any experiments in terms of hardware. Only for the mass storage, they developed an interesting concept which combines built-in SSD, SD card reader, and Eee Storage Online memory. However, due to its performances it could not completely convince. Also in terms of noise and temperature emissions the Eee S101 rates good. Similar holds true for the battery life. Despite of a very low total weight of slightly above one kilogram the Eee S101 convinces by a runtime of 4-5 hours, thanks to being equipped with a lithium-polymer battery. 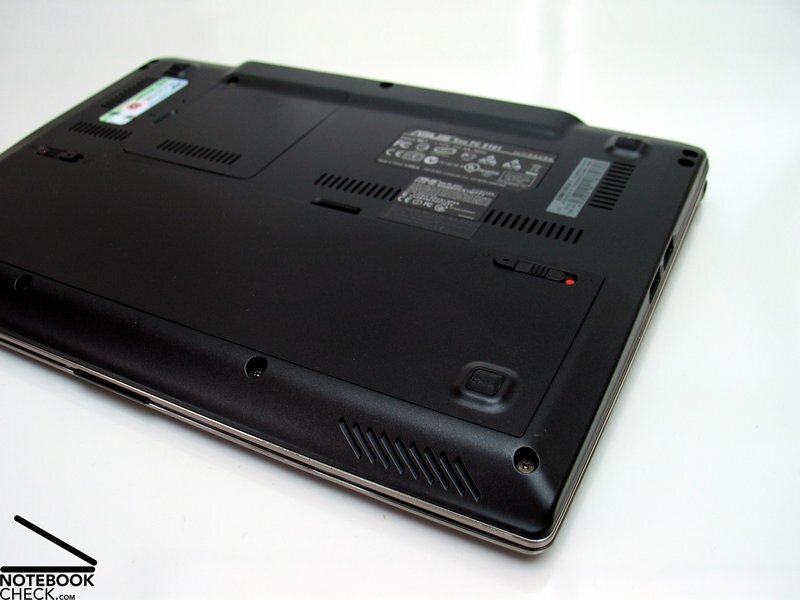 Overall, the Eee PC S101 does not find it hard to score points. Because of very good results in battery life, emissions, and especially its low weight of slightly above on kilogram, this mini notebook gets a total rating of 88%. Considering the faint screen and the high entry-level price of about 500.- euros, this notebook has to meet enthusiasts and fashion addicts for the price being justified. 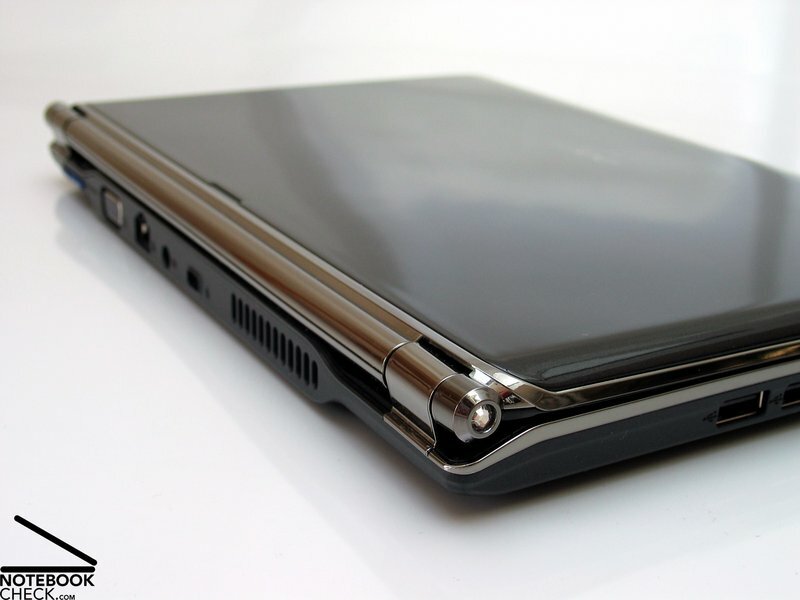 The Asus Eee PC S101 comes with a completely new case and focuses thereby especially on the optical charm. 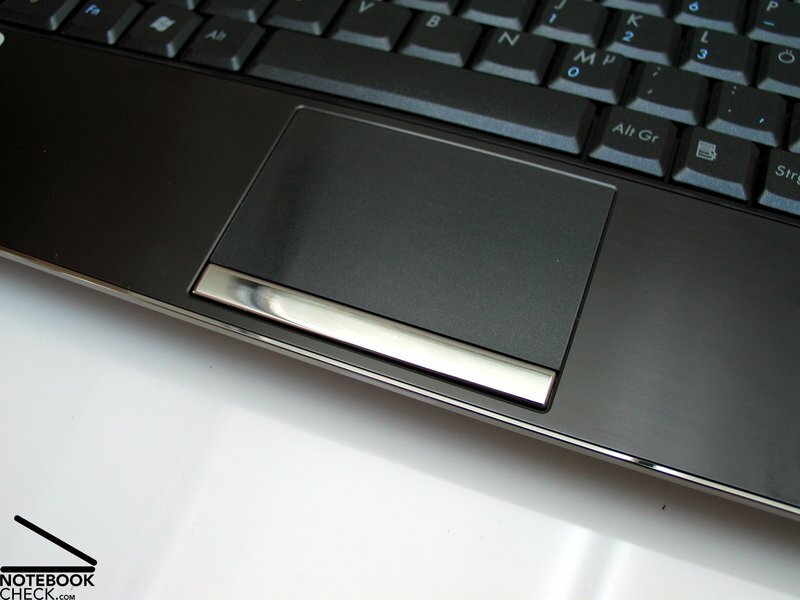 Also the touchpad was slightly modified, but still provides multi-touch features. ...the WSVGA display with LED back-light in the Eee S101 can hardly score points, because of its low brightness. 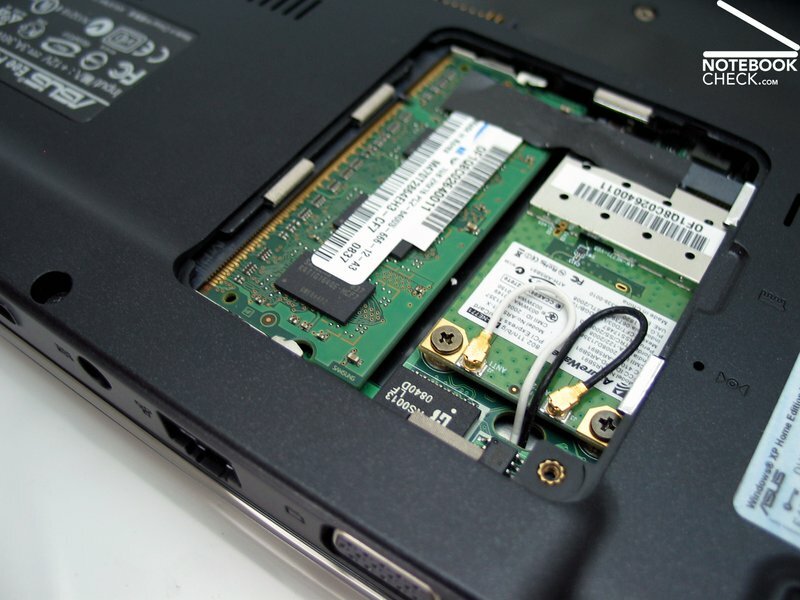 Intel Atom CPU and integrated GMA 950 graphic chip are typical netbook hardware and also used in the S101. The solution for mass storage is interesting: Asus combines SSD, SD card reader and on-line storage. Although the system fan runs all the time, the system noise stays always hardly audible. The surface temperatures, which hardly exceed 30 degrees Celsius, always stay in the green too. The integrated loudspeakers are fit for window's system sounds at best. The keyboard is the same also used in the Eee 1000H, but with a different look. A special feature is the Eee Storage, an on-line storage space, where you can store your data. Except of the lid in high-gloss look, especially the used materials ensure haptic experiences. ..or the mouldings around the case, which are also made of plastics. 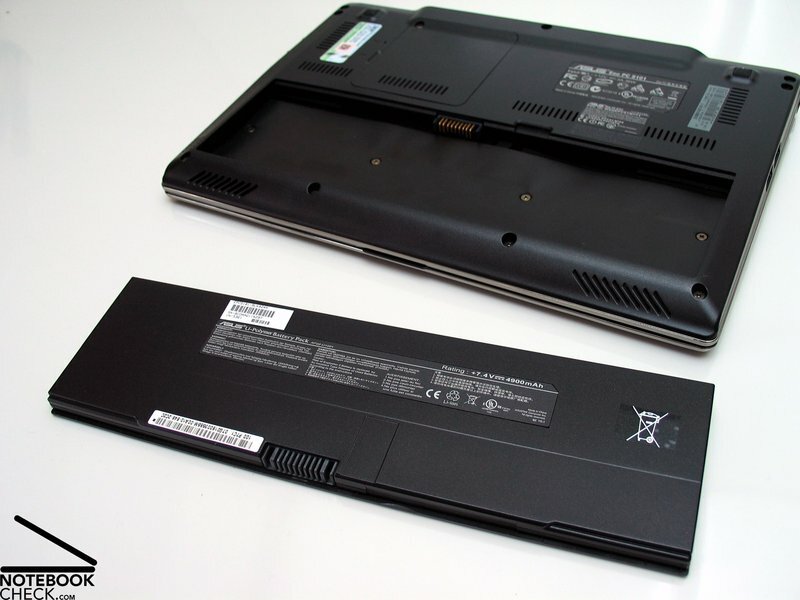 ... which for Asus had to use a new lithium-polymer battery in the Eee S101. ...whereas each side bears a precious jewel from Swarowski. The offered connectivity is not a surprise at all. 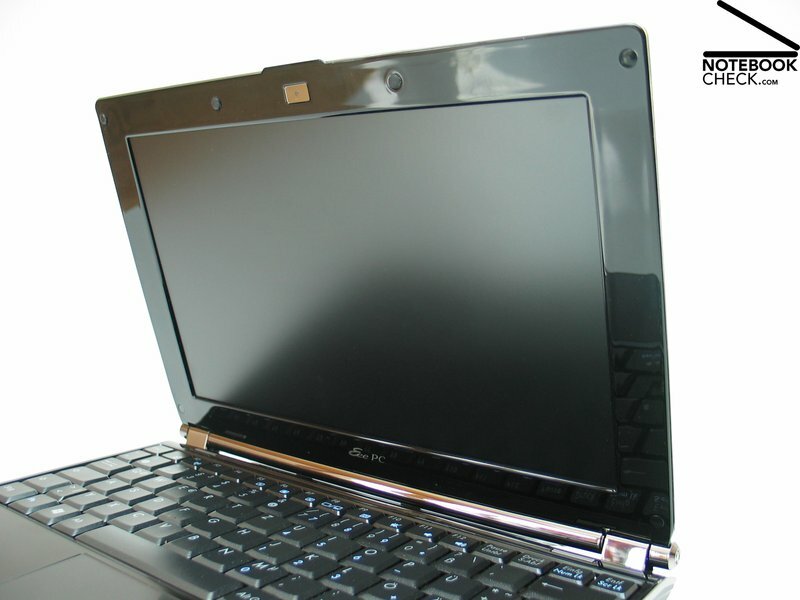 With USB 2.0, VGA, LAN, and audio interface only interfaces typical for netbooks are available. ...makes a battery life of up to 5 hours possible. So, the Eee S101 is also relatively ready for use on-the-move. + Nice haptics, because of metal inlays. With the current design Asus is right on the target. Despite metal inlays and jewels from Swarowski the case still looks decent and elegant. UMTS. The price of the Eee S101 is clearly above those of similarily equipped notbooks WITH built-in broadband internet. This all for some jewels and a little stainless steel? Despite a clearly higher price than the successful Eee 1000H, you will just get a faint screen like this. Because its price starts at about 500.- euros, it is especially hard for the Eee S101 anyway. 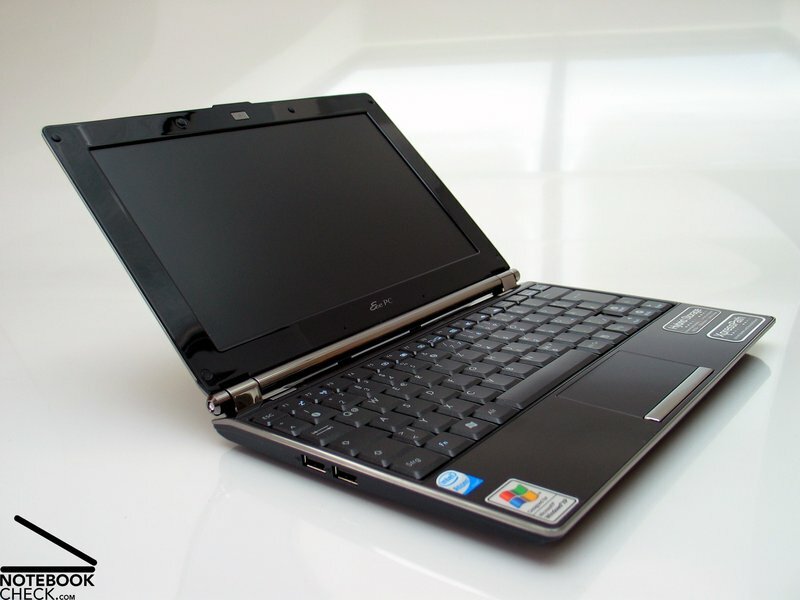 Similar netbooks are already available at a clearly lower price. 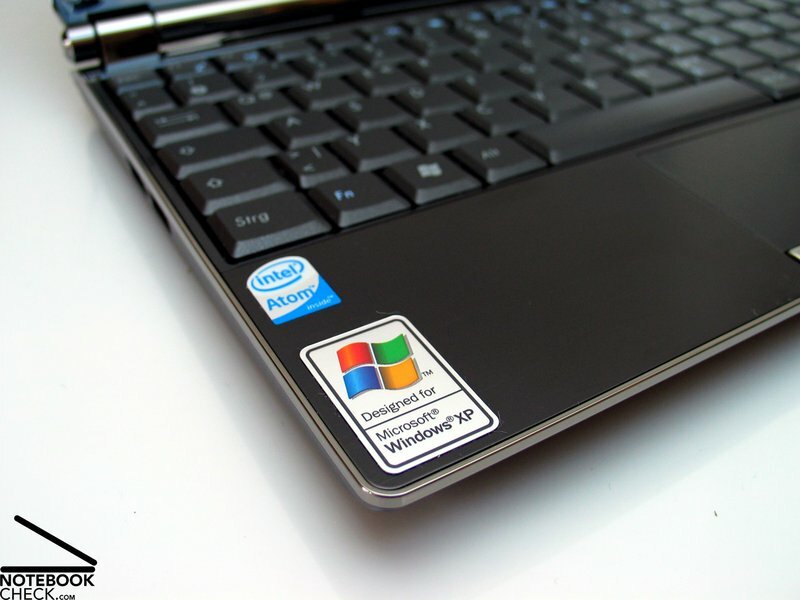 Regarding design the thoughest competitors are the Samsung NC10 and HP Compaq Mini 701eg. 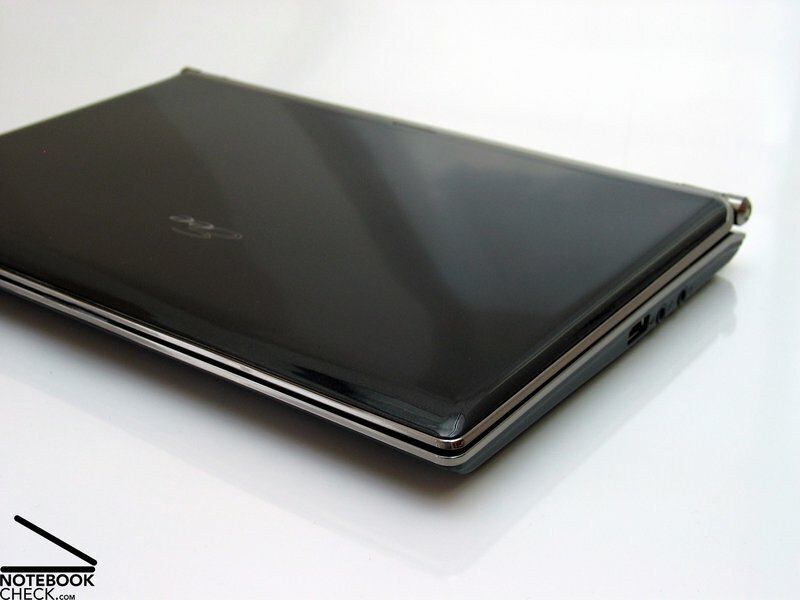 From the same manufacturer: still the Asus Eee 1000H.